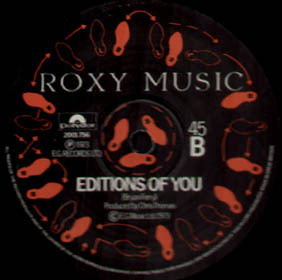 Lyrics to the song Editions Of You as recorded by Roxy Music. If there had to be a second single release from the For Your Pleasure album then this would have been it. This track has been cited in some punk quarters as the first punk song ever written. The instrumental solos swapped from Andy Mackay's famous duckwalk sax solo to Eno's wildest treatments, which no other Roxy/Ferry keyboard player has ever managed to replicate since, to one of Phil Manzanera's finest guitar breaks, and all in one song. The song was used as the b-side to the various single releases of Do The Strand. It was played on all the Roxy tours and on Bryan Ferry's 1994 Mamouna tour. Editions Of You has been covered by Men Without Hats & Mudhoney.